CIMB's Mr Song says the theme now is caution. The economist lost his job last year but got a new one within weeks. Renowned economist Song Seng Wun was not surprised at all to learn, in March last year, that he was among 15 employees being let go from CIMB Securities. After 25 years in Singapore's financial services industry, Mr Song has endured enough business cycles to understand that job cuts come hard and fast in his field when business conditions sour. Fortunately for Mr Song, his jobless status was short-lived; within weeks, he was offered the chance to rejoin CIMB as an economist for its private banking unit. But he knows that his industry is not out of the woods yet. "There were far fewer initial public offering (IPO) or merger and acquisition deals last year, and that capital market slowdown had a tremendous impact on investment banking. Elsewhere, trading desks were also hit by the weak commodity prices," he told The Straits Times. "We've had a somewhat better start this year with the stock market on a good run, but financial institutions are still reeling from last year's impact. The main industry theme now is caution - and if they need to fire to manage costs, they will fire. This has always been a very brutal industry." What happened at CIMB was part of a bigger story that has spooked Singapore of late. As news of layoffs by international banks - from Royal Bank of Scotland, Barclays to Standard Chartered, among others - continued to grab headlines in the past year, the anxiety around the future of one of the nation's key industries has also deepened. The troubling questions extend beyond the industry. Is the financial services sector facing a decline? If so, how long will it last and what does it mean for Singapore's economy and employment opportunities more generally? In the near term, the worry is certainly justified, DBS economist Irvin Seah said. "The downside risks for the financial sector are rising, due to the challenging external environment. The slowdown in China is having a broad-based impact on Singapore, and any interest rate hike by the Federal Reserve will also rock the financial markets. "Domestically, Singapore's dimmer growth outlook means companies are less willing to expand, hence less demand for loans. It doesn't help that the property market is still cooling," he said. Bank loans shrank 1.2 per cent year-on-year in January, the weakest showing since March 2000, Mr Seah noted as he warned of a "gloomy" outlook this year for the sector. The headwinds are well understood by the major financial institutions here, with all three local banks - DBS Group Holdings, OCBC and United Overseas Bank - expecting only low single-digit growth in loans this year. Plunging oil prices have also stirred up market fear over a potential asset-quality crisis, due to the banks' considerable loan-book exposure to the struggling energy and offshore marine industries. Talk of a banking crisis has irked DBS chief executive Piyush Gupta who, at a results briefing last month, said people are "misinformed" on the matter, before admitting that the bank will slow down on both hiring and senior staff wage growth this year. 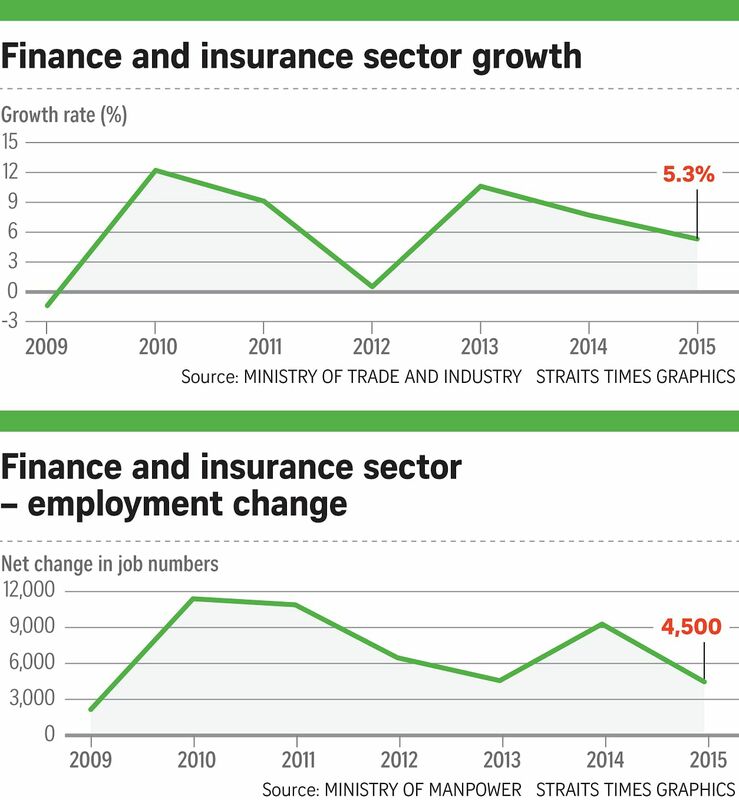 How well the industry grows after a bumpy 2015 will have a decisive impact on Singapore's economic outlook. The finance and insurance sector may only be about 13 per cent of the economy in terms of nominal value-add to gross domestic product (GDP), but at a time when the nation is feeling the pressure of a prolonged manufacturing recession, it is now one of the biggest growth drivers, contributing to 25 to 30 per cent of GDP growth in the past four years, Mr Seah said. And despite all the grim tidings last year, finance and insurance still grew 5.3 per cent year-on-year, down from 2014's 7.7 per cent but still the second highest behind only the 6.1 per cent growth notched up in the wholesale and retail trade sector, Ministry of Trade and Industry data showed. In comparison, manufacturing - some 20 per cent of the economy - suffered a sharp reversal from growing 2.6 per cent in 2014 to shrinking 5.2 per cent last year. That means finance and insurance chipped in about one-third - 0.7 percentage point - of Singapore's total 2 per cent growth last year; it is an economic cornerstone the nation can ill-afford to lose. The sector will be resilient enough to play that role in the long term, helped by Asia's status as an investment destination, a Monetary Authority of Singapore spokesman said. "Structural factors such as the longer-term rise of wealth in the region and Asia's relatively lower insurance penetration rate among advanced economies should help to keep activities in these segments on an expansionary trajectory. The large demand for infrastructure in Asia will also drive growth in infrastructure financing and investment," he said. Against that backdrop, growth will come from areas such as corporate banking, project finance, fund management and insurance industries, the spokesman added. In other words, while the "low-hanging fruits" for growth are disappearing, the slowdown is not industrywide, with many segments still on track for growth, Singapore Management University finance professor Annie Koh said. "In what I call the vanilla banking segment, where the daily bread- and-butter of loans and deposits business takes place, consolidation will continue. "But I think the 'middle segment' can thrive. This is where you facilitate the cross-border wealth and trade. With the Trans-Pacific Partnership and Asean Economic Community taking shape, I see a huge potential for Singapore, as an established trading hub in Asia, to play a big role in this space, to be the hub for wealth management and trade financing." This is why some operators, such as Manulife Asset Management (MAM), remain bullish even as other financial institutions cut down their presence in Singapore. MAM Singapore chief executive Wendy Lim said: "The asset-management industry in Singapore has been expanding steadily in recent years at 14 per cent compound annual growth rate over the last five years... For Manulife, we are pleased to see a faster growth than that of the industry. "We see tremendous growth potential in Singapore, given that it is a key wealth-management hub in the Asia-Pacific, its strong local talent pool and excellent regulatory infrastructure," Ms Lim noted, adding that MAM plans to expand its Singapore team this year. UOB is also at ease with its own outlook, despite a 1.2 per cent year-on-year drop in 2015 net profit - the weakest performance among the three local banks. "The financial markets are expected to stay volatile this year but we believe this is part of an economic cycle. Singapore's financial services sector is sound and has the resilience to manage the impact from the global economic slowdown," chief financial officer Lee Wai Fai said. "From Singapore, UOB has built over the decades an extensive Asian network, which has given us an edge in facilitating rising cross-border trade and investment. Singapore will continue to be the base where we support our clients' investments," Mr Lee added.